What is the exact solution of Catalyst Instant Access? What advantages ode it over the standalone, VSS (the VSS Campus with Stacking)? Cisco Catalyst Instant Access brings fabric extension technology (similar to Data Center FEX) with operational simplicity to the Campus Catalyst Ethernet switching line tailor made to needs of campus/enterprise network deployments. It creates a single network touch point and single configuration across distribution and access layer switches, ultimately driving simplified operations, distribution layer (Catalyst 6500/6800) features at access layer, consistent CLI and lower total cost of ownership (TCO). Instant Access is a solution that uses Cisco IOS Software to connect Cisco Catalyst 6800ia access switches to Cisco Catalyst 6500 or 6800 Series core switches. Once connected, the entire configuration works as a single extended switch with a single management domain. The solution is intended to simplify your campus network operations and management. It supports features such as switch stacking, Power over Ethernet (PoE) and Power over Ethernet Plus (PoE+), Security Group Tagging (SGT), Multiprotocol Label Switching (MPLS), Easy Virtual Network (EVN), and other premium Catalyst 6800 features in the access network. It also supports remote switches. Instant Access is similar to the Cisco Nexus Fabric Extender (FEX) solution. And there is a consistent command-line interface (CLI) across the two solutions. The primary difference is that Instant Access is customized to meet enterprise campus network needs, while the FEX solution is better suited to data center switching requirements. Cisco IOS Software 15.1(2) SY and later on the Cisco Catalyst 6500 and 6800 switches support Instant Access. The Cisco 15.1(2) SY IOS release supports a maximum of 1,000 Instant Access host ports across 21Instant Access clients. The Cisco 15.2(1) SY IOS release supports a maximum of 2,000 Instant Access host ports across 42 Instant Access clients. And it (The Cisco 15.1(2) SY IOS release) supports a maximum of 21Instant Access clients, distributed over a maximum of 12 Instant Access (FEX) IDs. The Cisco 15.2(1) SY IOS release supports a maximum of 42 Instant Access clients, distributed over a maximum of 42 Instant Access (FEX) IDs. Note: Newer code versions may scale the number of clients and ports higher, so check the latest software release notes for these numbers. There is no special software license required for Instant Access. The solution is supported with the IP Services licensed feature set on the Cisco Catalyst 6500 and 6800 and does not require any additional licenses. Q. How many 10-Gbps uplinks can be bundled in a single Multichassis EtherChannel (MEC) from an Instant Access client stack to an Instant Access parent? A. Up to eight 10-Gbps uplinks can be bundled (two 10-Gbps uplinks per stack member) from an Instant Access client stack to an Instant Access parent. Q. Can an Instant Access client dual-home to two different Catalyst 6500 or 6800 Instant Access-capable line cards over an MEC link? A. Yes, the fabric links can span multiple Instant Access-capable line cards in either a single Cisco Catalyst 6500 or 6800 chassis or across the VSS. This provides line-card−level redundancy at the Instant Access parent. Q. What is the distance limitation between the Instant Access parent and the Instant Access client? A. The fabric links are based on 10 Gigabit Ethernet links between the parent and the client. Both fiber and copper options are supported. The only distance limitation is based on the transceivers and related cables used. For information about transceivers supported, refer to the next question. Q. What transceivers are supported between Instant Access client and parent 10-Gbps links? A. The Cisco Catalyst 6800ia has two 10 Gigabit Ethernet SFP+ uplink ports. The ports support Short-Reach (SR), Long-Reach (LR), Long-Reach Multimode (LRM), and Extended-Reach (ER) Small Form-Factor Pluggable Plus (SFP+) fiber transceivers and associated MMF or SMF fiber cables. They also support 1M, 3M, and 5M copper Twinax cables. Note: The Cisco-FET-10G is not supported in the Instant Access solution. Refer to the 10 Gigabit Ethernet Transceiver Modules Compatibility Matrix for more details. Q. How many Instant Access clients can be stacked, and what is the stacking bandwidth? A. The Cisco 15.1(2) SY IOS release supports a maximum of three Instant Access clients in a stack. The Cisco 15.2(1) SY IOS release supports a maximum of five Instant Access clients a stack. Catalyst 6800ia stacking cables provide a bidirectional stack bandwidth of 80 Gbps. Note: Newer code versions may scale the number of stack members (and uplink ports) higher, so check the latest software release notes for these numbers. Q. Is the stacking module included with the 6800ia Instant Access client? A. Yes, the stacking module is built in and included with the 6800ia Instant Access client. No additional purchase is necessary. Q. Does the Instant Access client support dual power supplies to support IP phone deployments? A. Yes, the C6800ia-48FPDR is the Instant Access client SKU with onboard redundant power supply. Additionally, an RPS2300 as external redundant power supply is supported on all 6800ia clients. The Cisco Catalyst 6800ia client does not support Cisco StackPower. Q. Can the Instant Access solution and a traditional campus deployment coexist in the same Cisco Catalyst 6500 or 6800 VSS? A. Yes. 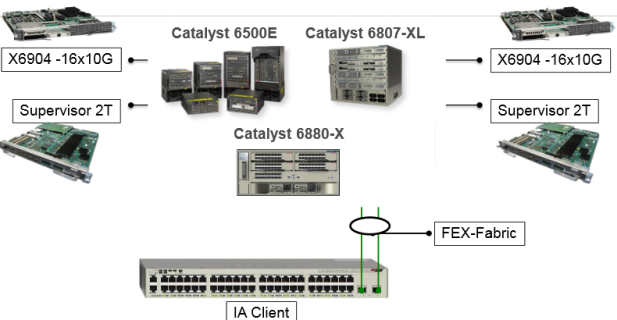 Both traditional network deployments (such as Cisco Catalyst 2960, 3650, 3850, 4500, and 4900 Series access switches) and the Cisco Catalyst 6800ia can coexist when connected to a single Cisco Catalyst 6500 or 6800 VSS at the distribution layer. Q. Can some ports of the Instant Access-capable line card be used for the Instant Access solution and other ports for traditional network trunk and or IP routed access? A. Yes. All of the Instant Access-capable line cards can support both Instant Access connectivity to a Cisco Catalyst 6800ia simultaneously with connectivity to traditional Layer 2 and Layer 3 Cisco Catalyst 2000, 3000, and 4000 Series Switches. The line card can operate in 1-, 10-, and 40-Gbps modes simultaneously, with some port groups configured in 40-Gbps mode and others in 10-Gbps mode. 10-Gbps mode is required to support Instant Access. Q. Can the 6800ia uplink support 1-Gbps SFP instead of 10-Gbps SFP+? A. Yes. Cisco IOS Software 15.1(2)SY2 and later releases support 1-Gbps SFP uplinks on 6800ia as well. For maximum bandwidth we recommend using 10-Gbps uplinks. Q. Can a compact switch be connected to an Instant Access client? A. Yes. A compact switch or any other switch can be connected to an Instant Access client host port. Note: Any remotely connected switches are not part of the Instant Access domain, so they are independently managed and operate the same as when directly connected to the Catalyst 6500 or 6800 switch. The Cisco Catalyst 6800ia supports PoE and PoE+. The Cisco Catalyst 6800ia-48FPD and 48FPDR modules support PoE (15 W) on all 48 10/100/1000Mbps RJ45 ports and PoE+ (30 W) on any 24 of the 10/100/1000 Mbps RJ45 ports, or a combination of them, with a maximum PoE budget of 740 W. Refer to the Cisco Catalyst 6800ia data sheet for more details and a complete list of capabilities. Note: New Instant Access-capable Cisco Catalyst C3560CX-12PD-S and C3560CX-8XPD-S compact switches can also support 12 PoE+ and 8 PoE+ respectively with a maximum PoE budget of 240 W.
Wireless access points can be directly connected and powered by the PoE/PoE+ capabilities of the Instant Access client. But the WS-X6908-10G line card cannot be used for 10-Gbps fabric link termination at the Instant Access parent? And the existing Cisco Catalyst 2960S and 2960X switches also cannot be used as Instant Access clients? Can the Cisco Catalyst 6800ia be configured to operate as a standalone switch in non-FEX mode? No, a Cisco Catalyst 6800ia can operate only in Instant Access client mode and does not support any local switching. However, the new Instant Access- capable Cisco Catalyst C3560CX-12PD-S and C3560CX-8XPD-S compact switches can operate as standalone switches in non-FEX mode. Does Instant Access support EtherChannel with multiple host ports on a single Cisco Catalyst 6800ia? Yes. Cisco IOS Software Release 15.1(2) SY2 supports up to two Instant Access host ports, per port channel, on a single Instant Access client or in the same Instant Access stack. Cisco IOS Software Release 15.2(1) SY1 and later can support up to eight Instant Access host ports, per port channel, on a single Instant Access client or in the same Instant Access stack. A total of 23 host port channels are supported per Instant Access stack. Instant Access does not support MEC across multiple Instant Access (FEX) IDs. What is the oversubscription on the Cisco Catalyst 6800ia? Each Cisco Catalyst 6800ia supports 48 10/100/1000Mbps RJ45 host ports and two 10 Gbps SFP+ uplinks. This is a default subscription ratio of 2.4:1 (48/20) across the links to the Instant Access parent. 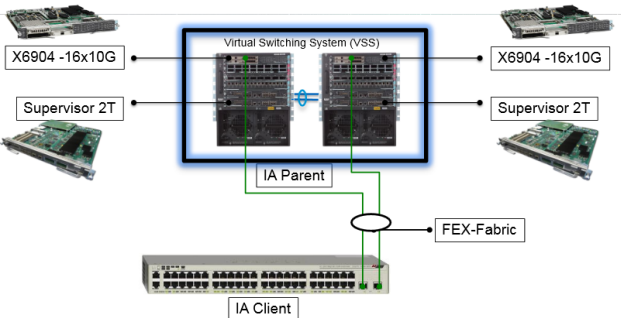 For people who want to have two Catalyst 6500 or 6800 switches in VSS mode as Instant Access parent, or use one switch function as Instant Access parent, the better way for you is to have two switches (a pair of Cisco Catalyst 6500-E or C6807-XL or C6880-X or C6840-X switches) configured in VSS mode as your Instant Access parent for high-availability networking. However, a single Cisco Catalyst 6500-E or 6807-XL with Supervisor 2T or 6880-X or 6840-X can be used as Instant Access parent when configured in VSS mode (without physical redundancy of the second switch). Instant Access technology uses VSS software code infrastructure to treat remote Instant Access clients as remote line cards, hence the need to enable VSS mode in a single switch acting as Instant Access parent. Cisco IOS Software Release 15.1(2) SY2 provides VSS Quad Sup support with Instant Access. This only applies to the modular Catalyst 6500-E or 6807-XL with four Supervisor 2Ts. The Catalyst C6880-X and C6840-X are fixed systems. Why is the default configuration of Instant Access client host port configuration “switch trunk allowed vlan 1” and not “all”? Each Instant Access host port can be configured in access or trunk mode (default is dynamic). If in trunk mode, there is a constraint as to how many VLANs can be trunked on each port. (up to the total of 1000 per FEX), to limit the amount of BPDU processing. The RJ45 serial console and Ethernet management ports are not required for Instant Access client operations on a day-to-day basis, because the client provisioning happens automatically. Once the Instant Access client is registered and provisioned by the Instant Access parent, the console is no longer usable. However, these ports are active whenever the 6800ia is not connected and allow Cisco Technical Assistance Center (TAC) engineers to access the local system. Yes. You can support services modules together with the Instant Access solution. Services modules can be deployed in the Instant Access parent (Cisco Catalyst 6500-E or 6807-XL switch). Instant Access clients provision themselves automatically when they connect to an Instant Access parent. The Instant Access parent automatically does an image check on the newly connected Instant Access client. If the Instant Access client image is different from the image on the Instant Access parent, the Instant Access client is automatically upgraded with the newer Instant Access client image. Instant Access client uplinks are also configured automatically by the control protocols running between Instant Access parent and Instant Access client, thus making the access layer truly plug and play. Instant Access client stack members are automatically provisioned when connected. Is local switching supported on the Instant Access client? No. The Instant Access client does not support any local switching. All of the Layer 2 switching, Layer 3 routing, and MPLS, etc. happens on the Instant Access parent. Because all the forwarding decisions are made by the Instant Access parent switch, the breadth of features available in these platforms extends to the access layer. For more details, refer to the Instant Access white paper. Note: The new Instant Access-capable Cisco Catalyst C3560CX-12PD-S and C3560CX-8XPD-S compact switches do support local switching, when operating in non-FEX mode (standalone mode). The Cisco Catalyst 6800ia supports local Layer 2 replication of multicast flows within the same VLAN. Multicast destination lookups are performed by the Instant Access parent; however, the replication of the multicast flows destined for the host from an Instant Access client occurs locally on that client. How does the traffic flow between two hosts directly connected to Instant Access clients? Host-to-host traffic flows through the Instant Access parent. The actual forwarding of packets happens at the distributed forwarding engine (DFC4) in the 6904-10G or C6800-32P10G or C6800-16P10G or C6800-8P10G line card at the Instant Access parent. SDP and SRP are new protocols that manage the automatic discovery and registration of new Instant Access clients. SCP and IPC/ICC are the same protocols used by the Cisco Catalyst 6500 and 6800 to manage installation and programming of modular line cards. These protocols are at the heart of the Instant Access solution, enabling automatic provisioning and a single point of management for distribution and access network layers. For more information, refer to the Instant Access white paper. What effect does the Instant Access control protocol between Instant Access parent and client have on the MEC links? Four control protocols run between Instant Access parent and Instant Access client: SDP, SRP, SCP, and IPC/ICC. These control protocols are lightweight and run transparently and automatically in the background. No additional user configuration is required. The Instant Access solution supports Enhanced Fast Software Upgrade (eFSU) using the In-Service Software Upgrade (ISSU) software infrastructure. An additional CLI is introduced (issu runversion [fex [range] <num> | all>]) to allow the upgrade of Instant Access clients during the eFSU process. It supports the capability to do a rolling upgrade of all Instant Access clients or to perform upgrades one at a time. The 6800ia supports 4 MB of shared buffers across all 48 ports. 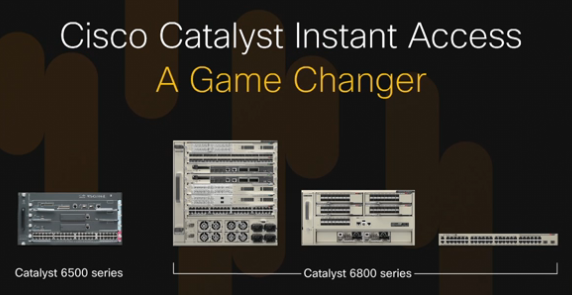 The Cisco Catalyst 6880-X Series, What’s New in 2015?